Middle Reach Restoration Informational Brochure and Map! In April of 2007 we began our largest restoration project to date, the Laguna Middle Reach Restoration Project (MRRP), spanning nearly 2-miles of the Laguna's east bank between Highway 12 and Occidental Road. Project goals include restoration of more than 30-acres of riparian forest and 12 acres of oak woodland (see progress map) to increase the complexity and extent of wildlife habitat and promote other valuable ecosystem services including bank stability, filtration of overland flow, carbon sequestration, and channel shading. The floodplain includes a declining population of endangered Sebastopol meadowfoam. We are experimenting with different management methods aimed at expanding this population and at the same time controlling over 10-acres of highly invasive non-native pepperweed. Project funding is through grants from the City of Sebastopol, Coastal Conservancy, Community Foundation of Sonoma County, U.S. Fish & Wildlife Service, and the Wildlife Conservation Board. Generous in-kind support is provided by the City of Santa Rosa which has donated the use of reclaimed water for irrigation, temporary use of reusable irrigation lines, and extensive ecological and technical expertise. This is the first phase of a larger effort to restore significant portions of a nearly contiguous 7.5-mile corridor preserved under conservation easements or as public lands. A feasibility analysis for restoration of the wetlands in the Laguna Wildlife Area between Occidental Road and Guerneville Road is anticipated to begin in late 2008. 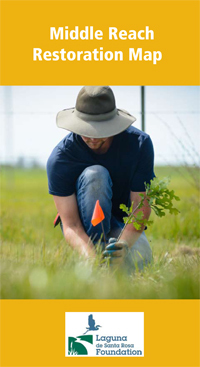 There are many opportunities for Laguna volunteers to participate in the MRRP through removal of non-native invasive plants, bird monitoring, tree planting, and maintaining the thousands of young seedlings already in the ground. Work days will be announced in advance so please check the Volunteer Schedule or ask to be added to our mailing list!